We have heard this question over and over for over 40 years: “Is it okay to paint over existing paint?” Typically, the answer is yes – with proper preparation, cleaning, and priming. But there are times when the best investment is to go ahead and remove the old paint and start over again. Don’t rely on luck or, “trial and error” with an inexperienced painting company or crew. Get the best results by letting our team provide a proper evaluation then invest the time and the effort needed to do your job right. Our experts have the experience and the know-how to properly evaluate and prepare a variety of surfaces to ensure that the paint adheres optimally and that your paint job lasts as long it should. Removing paint is time consuming and expensive, but will result in a job that is better looking and will last longer. We don’t believe in cutting corners just to keep the cost down, and will advise you honestly about your preparation needs. That’s The Queen Anne Difference, which has helped us to earn the trust and repeat business of many hundreds of customers for more than 40 years. We’re an EPA Lead Safe Company with the commitment, the equipment, and the training required to keep you and your property safe from lead contamination. Our crews are experienced and equipped with the proper tools and supplies to remove failing paint in both an effective and efficient manner. We can also offer a Maintenance Service Program to help keep your newly painted surfaces properly maintained and in great condition. With our help, your restored surfaces will not only look beautiful, but they will also last longer! 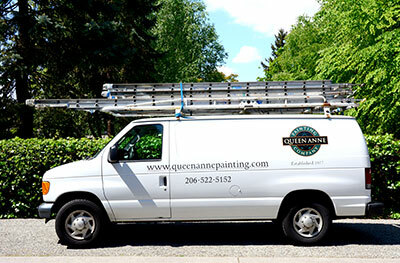 Call Queen Anne Painting now to learn more about our paint removal and restoration services.